Starfall’s intuitive learning environment encourages children to explore letters and sounds, word recognition, reading comprehension and fluency. Developed under the guidance of professional educators, our phonics-based learn-to-read activities encourage free exploration and play within a sequentially organized framework. We also offer fun mathematics and music activities. Here’s how to make Starfall work for you. Encourage children to play and explore by clicking on any letter in any order. They will come to recognize the relationship between speech sounds and letter forms. This is the "Alphabetic Principle," the foundation of phonics. Available on your desktop browser and in our FREE ABCs mobile app. Each numbered row features a vowel sound. Students listen to, manipulate, read, and master each vowel by interacting with the associated book and games. Available on your desktop browser and in our Learn to Read mobile app. With a basic understanding of the Alphabetic Principle, children are ready to expand their reading vocabulary and comprehension while exploring a variety of genres and topics: classical music, fine art, poetry, and more! Available on your desktop browser and in our It's Fun to Read mobile app. The plays, folk tales, informational texts, myths, and fables transition children from learning to read to reading to learn. These vocabulary-controlled stories ensure meaningful practice reading high-frequency words (also called sight-words). Available on your desktop browser and in our I'm Reading mobile app. Our Complete Guide to Using Starfall provides a deeper look at our children’s activities, products, and supplemental parent and teacher resources. It will help you guide your children through all our exciting activities and share supplemental products and resources to enhance your child’s learning experience. If you and your child enjoy the free resources at www.Starfall.com you are sure to love the expanded collection of songs, mathematics, and reading. Membership unlocks hundreds of activities spanning Pre-K through 2nd grade. Your tax-deductible membership fee ensures that we can continue to provide free Starfall resources and offer high-quality, low-cost, educational materials. Under IRS guidelines, any annual Home or Teacher Membership fee paid to us is 100% tax deductible as a contribution to the extent allowed by law. There is no tax deduction as a contribution for Class or School memberships. Our Parent-Teacher Center offers valuable tools and resources for free, including English Language Arts (ELA) and math worksheet generators and printables for your Pre-K and Kindergarten children. Use these to enhance and support your child’s Starfall learning experience. Are you interested in expanding your Starfall products? In addition to our complete Pre-K, Kindergarten English Language Arts (ELA), and Kindergarten Mathematics curricula, we offer many other products that work in tandem with our membership website. Visit the Starfall Store for other high-quality, low-priced educational materials. Our Starfall Pre-K and Kindergarten ELA and Mathematics curricula were written by master teachers and field-tested in classrooms nationwide. Perfect for both classrooms and homeschools, these products guide new and veteran educators to capitalize on the enthusiasm created by our online children’s activities. Starfall’s standards meet and exceed state and Common Core standards, ensuring students are prepared for 1st grade and beyond. Save time and energy with our quality materials, pre-planned lessons, crafts, recipes, activities, songs, and more! Integrates math, science, health, creative arts, social studies, physical movement, early literacy, and social-emotional development through guided instruction and imaginative play. 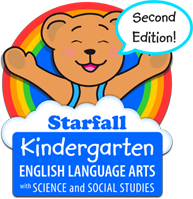 Research-based, effective, and Common Core aligned, our Starfall Kindergarten English Language Arts curriculum instills confidence and inspiration in teachers and children. Integrates science and social studies. Explore early algebraic concepts using numbers, shapes, and measurement tools while connecting mathematics to everyday scenarios and practical problem solving; research-based and standards-aligned. Starfall.com is a program service of Starfall Education Foundation, a 501(c)(3) public charity. The website has been a free online resource since 2002, teaching millions of children to read and inspiring a love of learning through exploration. The website is kid-safe. There is no advertising and we do not collect any personal information from children— in fact, we’re one of the safest children’s websites on the internet! Members enjoy mathematics, additional reading activities, and songs. Learn more about Starfall Education Foundation.